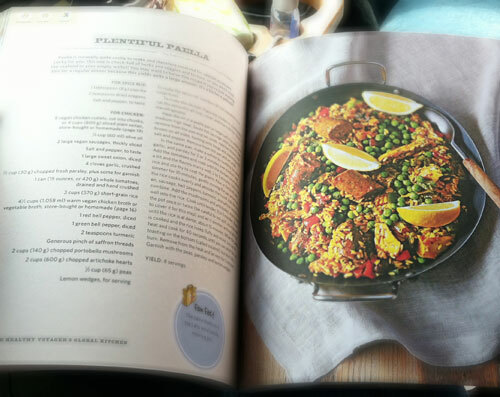 Our First Giveaway –> The Global Kitchen Cookbook! 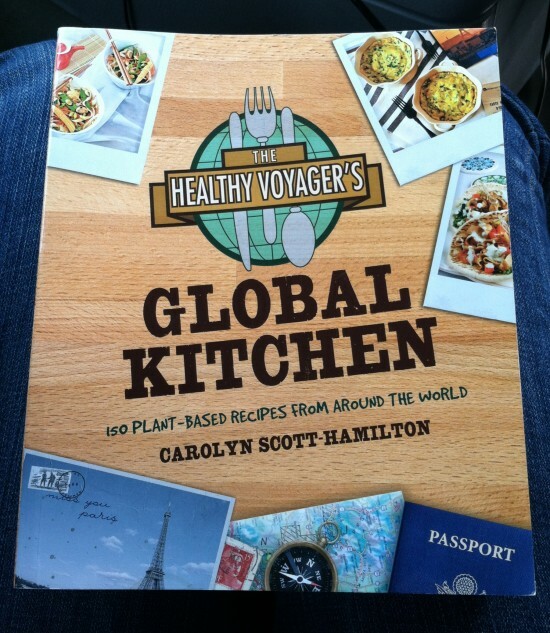 One of the first vegan explorers to set sail through the veg-foodie seas is the one and only, Carolyn Scott-Hamilton (AKA The Healthy Voyager). I remember first learning of Carolyn’s adventures, reporting on her blog and to VegNews about her veg discoveries across the world. She’s interviewed vegan celebs, found vegan fare in the most exotic locales, and regularly reviews awesome vegan products via her YouTube channel. I’ve been honored to work with Carolyn on a few projects in the past, via my freelance work with Vegan Mainstream. She’s one of those rare individuals that returns emails within 24 hours!! ;) She’s just lovely to work with and I’m excited to share in her latest project, which is her outstanding vegan cookbook, The Global Kitchen. Inspired by her travels, this cookbook is packed with more than 150 vegan recipes from around the world! I’ll be honest, since being on the road I haven’t had the privilege of cooking in a real kitchen for some time. 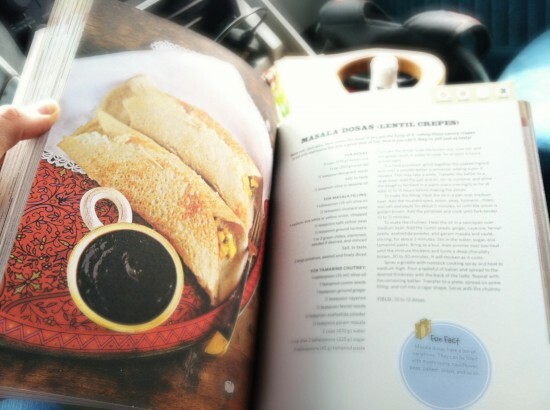 But I’ve done my fair share of flipping through and drooling over these recipes. Seriously. I need to stop teasing myself and just get rid of this cookbook already. ;) Are you ready to help me?! ‘Like’ and/or ‘follow’ The Healthy Voyager on Facebook and/or Twitter. Leave a comment below this post with the name of your favorite vegan destination (so, something like “NYC” or “San Fran” or “my kitchen,” will do). Comments close at midnight on Friday, March 16th. My favorite vegan destination is WorldFest! I look forward to it every year http://www.worldfestevents.com. p.s. I didn’t see “the vegan voyager” (as per your step 1. above) on facebook, I did see “the healthy voyager” hope that’s correct. I am lucky to live in my favorite vegan city, Portland, Oregon. My fav destination in the city? Portabello’s vegan trattoria! My favorite vegan destination is Providence, RI – where Garden Grille and Wildflour Vegan Bakery inhabit the same little strip mall. I like you on FB :) Also, I love Boulder, CO for good veg eats! I’m a huge fan of the vegan sushi!! I love to cook as well so it’s a toss up!! I guess my kitchen wins thou cause I can control what gets put in my belly!! Berkeley for Chick o’ Peas, Nature’s Express, Cha-Ya, Cafe Gratitude & Cinnaholic! South city, St. Louis! I love the Ethiopian place on Grand Ave.
Bar Harbor ME is my favorite vegan dining destination. Great Thai and Mexican, excellent tofu scramble bagels, and superb vegan ice cream! oh this is a non-contest. portland!!! of course. For me it’s a close tie between the Bay Area (millennium & cinnaholic) & NYC (Candle Cafe, Lula’s, pure food & wine) so many great places popping up everywhere! My favorite vegan destination is Cruda Cafe which is located in the St. Lawerence Market in Toronto, ontario Canada. Ps. It would be a real treat to win this book! Sipz in North Park in San Diego! Great variety and amazing vegan desserts! Found a great little place hidden in the alley ways of Marrakesh when I was there, went many times in my short visit! Another vote for Austin, TX! It seems like a new vegan eatery pops up every week! Portland for sure, with Seattle as a close second! Karmavore Vegan Shop, New West, B.C. The Green Owl, Madison, WI! i just returned from Spain and although it was a challenge finding vegan eats, i had some great finds, *especially* in Granada – so right now that’s at the top of my list! Yep, definitely my kitchen. Because I can’t always find vegan versions of things I’m hungry for, but I can always make them. My kitchen, only because there aren’t a lot of options in my area and I haven’t traveled to any places that are really vegan friendly yet. “followed” the healthy voyager on twitter! As a New Yorker, I feel obligated to say NYC. We have so many vegan restaurants, you could spend a whole year here trying all of them! But I’ve never had a problem anywhere in the world. There are always delicious vegan finds to be had. I ‘Like’ The Healthy Voyager on Facebook and…. my favorite vegan destination? My kitchen! I like the Healthy Voyager on Facebook. I like Eaux Vivres in Montréal. Like you, I guess ! and on twitter as accessintel! I ‘Like’ The Healthy Voyager on Facebook and Twitter! My favorite vegan destination is Asheville, NC! WOW>>>Boy do those pics ever look good enuf to eat!!!! Post Punk Kitchen!!!!! Isa rocks! Having lived in Berlin, Germany for the last 2 years, I can now say it’s a place that I look forward to returning to for amazing vegan eats. Between fast food burgers at Vego Foodworld, pizza at Sfizy Veg, German food at Viasko, the all-vegan supermarket Veganz, and more, Berlin’s got it covered for nearly every vegan thing imaginable. And did I mention it’s cheap (for Europe)? Ach Berlin, ich liebe dich. p.s. but I’m back in Boston now and it’s getting better! 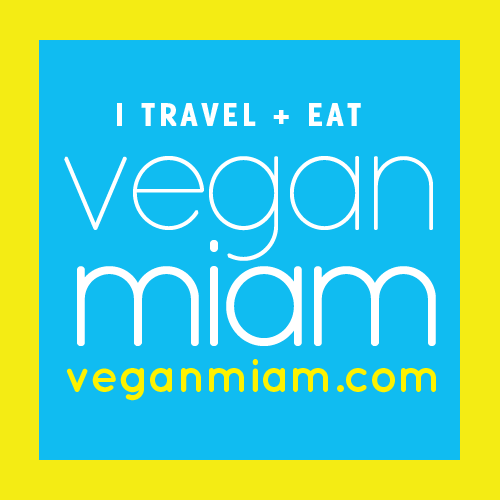 My favorite destination city is anywhere my lady and I can experience new vegan/raw exceptional food! My favorite vegan destination is the V Spot in Brooklyn. They make the best BBQ seitan wrap and nachos. Strong Hearts Cafe in Syracuse, NY! I liked the Healthy Voyager on FB. My favorite vegan destination in NYC and I just came back from spring break there… ate my way through. Liked on FB. My kitchen right after farmers market or CSA pickup. I would love to visit NYC as my vegan destination! Following you on Twitter @teslaca. I’d love to visit Portland, OR to check out the vegan eats. It’s been many years since I’ve been there and things have changed a lot! Right now, I love picking up my CSA veggies as a start to lots of great vegan meals from my kitchen.